These are amazing headphones. I hear a lot of people complaining about the fact that these headphones sound "bright", or "aren't warm", or don't have "the right color". This is not a bug, it's a feature. In fact, it's THE feature. They operate on different principles. Electrostatic diaphragms don't have a lot of the physical limitations that magnetic drivers have, they can respond pretty much instantaneously - they are capacitors, not inductors, and since the diaphragm itself is non-conductive, they are very, very light. Plastics not copper; there's no magnetic field to fight against. What this means is that whatever you put in the back of the amplifier is what you get to hear. They run on a 600V bias, and the signal itself can be up to 2.3KV at max volume, so the current going to them is teeny tiny, and that's great for frequency response. Seriously, these things will physically shake your head with bass, and at the same time deliver extremely crisp highs. This is what happens when you can get away with having something like 12 square inches of totally flat diaphragm over each ear moving back and forth REALLY fast. As a bonus, they are also very, very light. I find the build quality to be quite good, but they are nearly all plastic. I'm sure it's possible to break them, but that's true of anything. Koss being Koss, though, I am not worried. They feel plenty sturdy, and if they ever turn out not to be, they have that awesome lifetime warranty. If you like your music to have a particular sound, you are going to need to run it through a preprocessor of some kind. I use a Schiit Bifrost Multibit, and sometimes I need to tweak things to compensate for mixing / mastering / recording problems, as well as for music that must have sounded great when run reproduced through a bunch of tubes, but is missing some equalization when reproduced exactly. This is definitely a factor depending on what you listen to and how you listen to it. If you are running an analog stack, I don't think you'd have the same issues as you're not going for a flat response in the first place, but you may have a harder time making adjustments. I just click stuff for that, so for me, it's good to know that these are as close to a straight digital pipe into my brain as I am going to get as long as the final component in the pipeline is ear-shaped meat. The only thing that I can complain about is that there isn't enough clearance around the RCA jacks for proper audio cables, but the back comes off of the energizer very easily and it's a quick fix with a drill bit. It's definitely an annoyance, but not a huge deal. You also need an adapter to use the headphones with a non-Koss energizer, so that's a bit lame, but I can understand the reasoning behind it, since the voltages involved are definitely non-trivial. They come with a 4' cable built in plus a 6' extension, so you can modify the extension without needing to risk getting into anything fragile. If you are buying a fancier electrostatic amp you probably already have what you need or know where to get it. In any case, I like them, and you might too. I'd definitely give them a listen first... it's not that they aren't awesome, but they *are* a bit specialized. If flat response is something you like, you'll love these. If that sounds like a problem that needs to be solved, maybe these aren't a great fit. Electrostatics are not electromagnetics, and in my eyes, at least, that's a great thing. Ultra-clear, neutral sound without any trace of hardness or steeliness. Highly detailed sound that lets you listen deep down into the mix. A little laid back compared to Grado 'phones but it is, of course, a matter of preference. Others responders have criticised the cheapo rca connectors and dual concentric volume control, I agree. I hope Koss markets another electrosatic that is geared to the audiophile market. With a few improvments in parts and a better power supply this thing could challenge Stax and ulra-expensive dynamics and dedicated headphone amps. I bought an open box new Koss ESP-950 on eBay back in 2002 and used them without a problem for five years when they began to exhibit a low level hum which, for the life of me, I could not eliminate. I sent the 'phones back to Koss and they, without any hassel, replaced it with a renovated unit. I'm not a headphone fanatic but I clearly prefer this Koss to the Senneisher HD600 which, in comparison, sounds crude. Overall, they are clean, fast, and neutral. The ESP-950 has been used in a bedside cd system. Over the years I've used various cd players and interconnects. Each and every time I changed players and/or cables I've heard obvious sonic differences. It's been a full year with the second unit and I have no problems to report. Perfect. No questions asked lifetime warranty. Koss is helpful and courteous. Super sensitive to what it's fed. Have used Denon DCD-1650AR, Cambridge D300SE, Cambridge D500SE, and Yamaha S1500 disc players. Many interconnects from Monster M series to various pure silvers. I prefer Homegrown Audio Silver Lace and Silver Diva. A decent power conditioner may help if you think your electricity is suspect. I live in an old apartment building and find an Audio Power Powerpack ll beneficial . True L/R signal to each earpiece without crosstalk. If you have a suitable technical application, warm equipment, or very selective music taste, then this is incredible bang for the buck considering how expensive the competition is. It's not built particularly well considering the price, but Koss has that warranty. This is not a refined audiophile product. Technical users are still probably better off with something more rugged and/or "professional". I tried these at CES. They appeared to be designed as a flat response, extremely low distortion headphone for specialized applications, or by some pocket protected engineers who never took the time to listen to them. Maybe they listened to them but have bad taste. Even in speakers you don't want a flat response for enjoyment of commercial product. Headphones are even less flat, since they need to take into account both the expected speaker response and the effects of the room on the tonal balance. These headphones are just flat, kind of like the Etymotic ER4B. There is what we audiophiles like to call a perceived "lift" from the upper mids and beyond with commercial recordins on a flat, high fidelity source. The only way I could see you using the ESP950's as a primary playback device would be as said specialty product (with dummy heads or flat response live mics, including technical applications) or with a very warm preamp, cartridge, or eq in the line somewhere. Otherwise you'd be stuck playing recordings that are either naturally rolled off on top (a lot of acoustic stuff) or mixed/mastered on very bright equipment. Hence all the recommendations in these reviews about needing to use just the right recordings on it. Probably most of the recordings they're refering to are not actually meant to be heard on flat transducers anyway, but aren't necessarily aggressive and unpleasant when presented in such a manner. E90sseemed to have been abit large for lying back on pillow and just to balky but did overcome the small inconvenence. Sound, comfort. Good value compared to an independent headphone amp/high quality can combo. Lifetime Warranty. The Amp is chintzy-- cheapish plastic, mediocre connects & volume/balance control, although they work. The detachable earspeakers' connects with the headband don't work well-- they can easily disconnect. For comparason's sake, I've got a Headroom amp I use to power Sony MDR V900's, Grado SR200's & my top dynamic choice: Sennheisser 580's. The sound source for all is a desktop Nakamichi CD system that I use on my nightable. 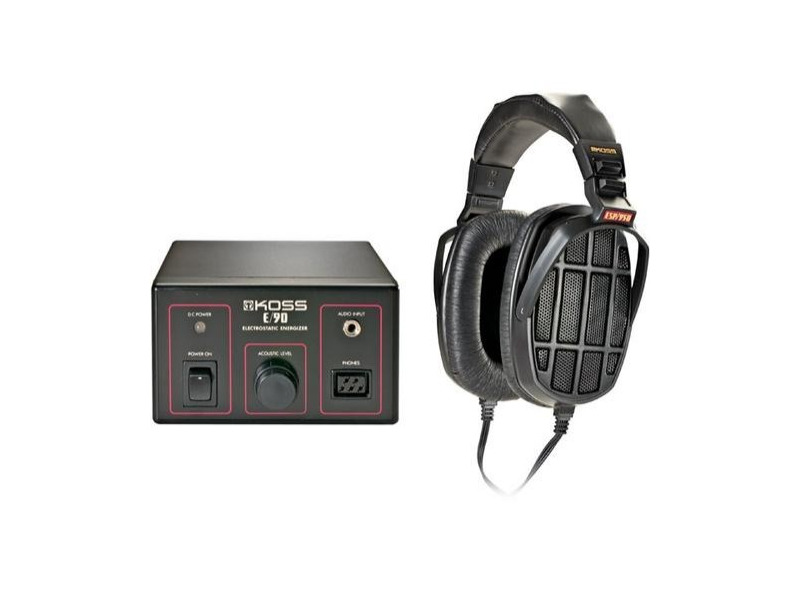 The Koss 950 compares most closely with the Senn's sound. The Senn's have excellent transparency, but the Koss, with its corresponding driver, has even more. Details on the Koss are more precise-- truly impressive. Each instrument is excruciatingly defined. The Koss have very high brightness in the mid & high ranges-- in fact this sounds slightly exaggerated compared to the others. Lows are tight & overall good. On the Senns lows are more pronounced though less defined. In sum the sound is very high quality. Sony MDR V900, Senn HD 580, Grado SR 200 with Headroom Amp. Simply put: The highly accurate & transparent sound quality! Listen to any programing you like and you'll appreciate the recording as if it's the very first time you're reviewing it. And the No questions asked LIFETIME WARRANTY! I cannot believe the inane and ludicrous use of this web site. I though it was to be for honest and impartial evaluations of the product under discussion. To those idiots who don't know what a message board or chat rooms are for get a life. Now to my review. In one word STUNNING! These phones have got to be close to being the best phones on the market. Crystal clear highs and subsonic lows. One characteristic that dynamic phones can not do, is the complete lack of coloration and a dynamic range that exhibits absolutly no distortion. Bass is below the floor, doing somethig I have never experenced with headphones before, actually feeling the bass not just hearing it. Probably because of the huge size of the transducers. Simply, the best phones I have ever had and if that wasn't enough, comfortable to wear. Exceptional performance and add to that a LIFETIME WARRANTY! Who could ask for aanything more. The E90 energizer/head amp is excceptional. I have used dynamic phones with a Harmon/Kardon 3370 receiver, but this little head amp is exceptional, no noise excellent bandwith and dynamic range. as for the volume control on the unit, I don't use it. I've hooked it up to the pre-amp ouput on the H/K receiver and control the voume via the preamp. In fact, I recommend that this unit be integrated into the stero system for best flexibility. These usits a designed for portable use but to me, it is a shame that these mavelous headphones would be hooked up to a crappy portable walkman, Use a Sennheiser HD 570 , 580 or 590. as for the guy that prefered Sennheiser HD 500's over the Koss, get your hearing checked. I have Sennheiser HD 590 & 600, they pale nex to the Koss ESP/950's. I relagated the Sennheiser to my backup drawer. I wish I could review these headphones over and over again to negate the reviews of the idiot that kept crabbing about Koss, who I think showed extreme patience with this customer. these are simply one of the best sounding headphones on the market. however they''d be even better if koss would address some of the problems below: -as most people, i too have had that horrible squealing problem. here''s a couple of tricks to (momentarily) stop it: 1) give the outer portion of the ear piece a flick with your finger 2) turn off the headphones for about 8 hrs. then vaccum the outer portion of each ear piece - do not vaccum the inner portion. -i also agree with those who do not like the volume / balance control, koss should replace it with something like a noble or a top-end alps. -those rca jacks are hideous; they don''t acdept my neutrik spring-loaded "make ground first, break ground last" rca''s. koss should replace them with some (hardwired) wbt''s, cardas, or tiffany''s -it would be nice to have a set of direct passive rca outs; see above. -an upgrade option for that wimpy power supply; something like the creek obh2; an upgrade option to use 6 "D" sized batteries instead of "C". -get licensing from headroom to use their processor. -and finally, the 1/8" mini-jack input should be replaces with a 1/8" OUTPUT, to allow the "energizer" to be used as a headphone amp for a pair of dymanic headphones - say the porta-pro''s. apart from my reservations listed above, these are still 5-star headphones. I''ve had these phones for many years and after putting up with the squeal for a long time I sent them to the repair facility here in Canada. They completely replaced the units and now they have been working for the last 3 months perfectly. I have always loved the sound (or lack of it) ever since I first purchased them. They really don''t have any sound but simply give you what''s on the recording. They are also extremely comfortable to wear for extended periods adding to their enjoyment. Other than the squealing problem which I hope now Koss has fixed I give them a very high rating. Highly recommended. Their lifetime warranty is very reassuring. I had my other pair apart trying to fix the squeal and ran into a few problems. Koss still replaced them-not all companies will do that for their customers. Clean, clear airy sound. Portability. I am very satisfied with my purchase. Everytime I inform people that I spent over $500 on headphones, they react like I'' nuts...until they give these beauties a listen. I have never had a problem in the time I''ve had them (since 1994). No "squeal," no discharges. It is important to attenuate the volume on the accompanying energizer properly or you will introduce distortion. Adjusted properly, the sound is crisp with airy highs and decent bass. Midrange is incredible. They even sound great with a portable CD player. By the way, I''ve auditioned Sennheiser 570''s as well. Even though the 570''s are not the top of the line for Sennheiser, the 570''s can''t even hold a candle to the Koss ESP-950''s. I did find the reason this headphone only has (at this time) a 3 out of 5 as a review rating. It seems one reviewer has stated his opinion about 8 times this headphone is a "1." Please be an adult and say your piece once. I also agree with the other reviewer that this is not a proper way to air grievences against another reviewer. Perhaps you can e-mail each other to resolve your problem.